Bringing you the latest and the greatest news on Billy Gilman! 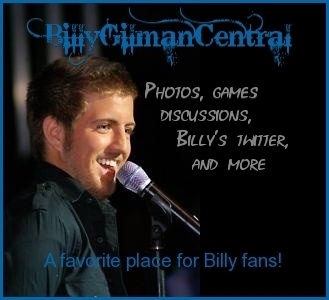 Be sure to follow Billy Gilman's Official Twitter Page at http://twitter.com/bg524! Billy Gilman's debut album "One Voice" made it to #56 on Billboard's Top 100 Country Albums of the decade! Billy Gilman is currently flying back and forth to Nashville to write and record new music! » Number of Twitter Followers! » what book are u reading? i just wanted to know if his myspace page will be updated and new since his official website will be new this month. anyone know when is official website will be up and running. If you haven't already hop over to www.BillyGilman.com There's nothing much at all there except for a huge picture of Billy saying "Billy Gilman new official website coming August 2011"
I'm excited to see what will be on the new website as well as what Billy may have in store for us. Although there's no official word on a new album or any new single releases, I thought I'd update everyone on what's going on with Billy. Justin Bieber won four awards at this year's American Music Awards: Pop/Rock Favorite Male Artist, Pop/Rock Favorite Album, T-Mobile Breakthrough Artist of the Year, and the biggest title of the night, Artist of the Year. Billy Gilman-- Part of David Archuleta's Biography! hey there Billy Centrics! I was just browsing some info on David Archuleta (2007 American Idol runner-up) and found that Billy is mentioned in his biography, and in fact that Billy's song "One Voice" played a part in David getting his career jump-started. Another brief mention of Billy occurred in this live press release on September 6. Again, I have highlighted Billy's name in red. Article- "Billy Gilman Participating In Telethon"-- READ! Hey all! Here's an article about Billy performing at the 2010 MDA Labor Day Telethon! It was released September 3.